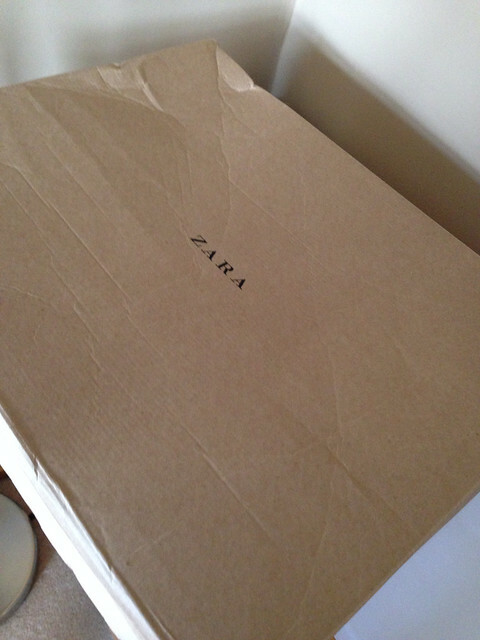 I hold my hands up - I was seduced by the last chance offers in the Zara sale and ordered a few bits to the house...but was it a case of them all still being in the sale because nobody wanted them?? 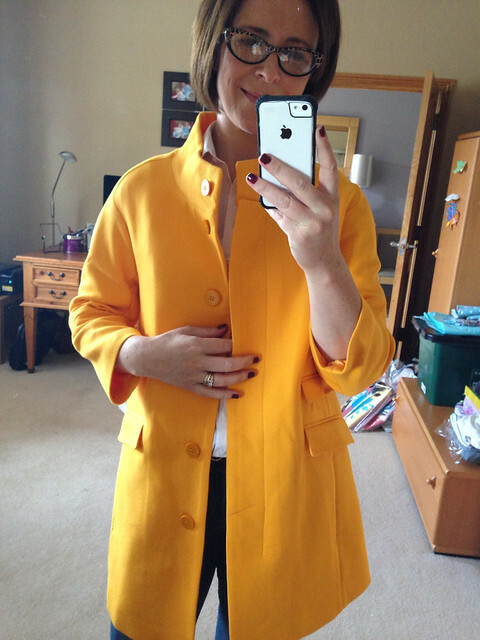 First up, this yellow/orange coat which was down to £29.99. 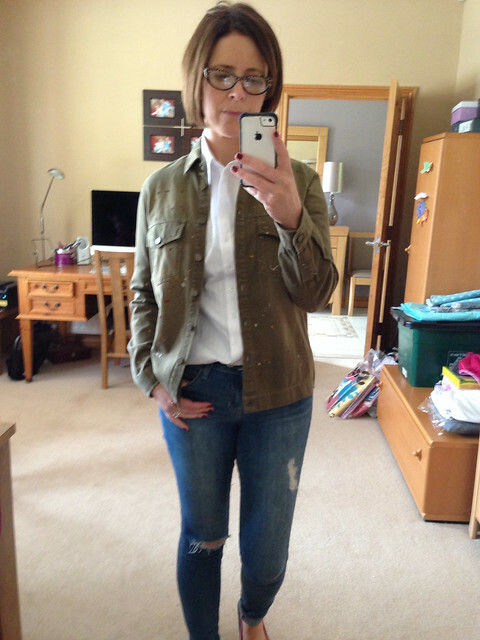 I liked the shape and thought it was an inexpensive way to scratch the yellow coat itch. It's unlined and made of a mid-weight twill/cotton mix so wasn't going to work in the cold weather but I thought it would be nice for the current cool snap. I shared it on Instagram and decided to keep it....but 3 days on, I was still struggling to actually go out the door in it. Why? Well, the husband did comment on the colour, not in a negative way but in that 'raised eyebrow' way that only a husband can...and that made me doubt. He's got a good eye for what suits me and is rarely wrong. Roll on 2 more days and I realised it wasn't going to happen. Back in the box. 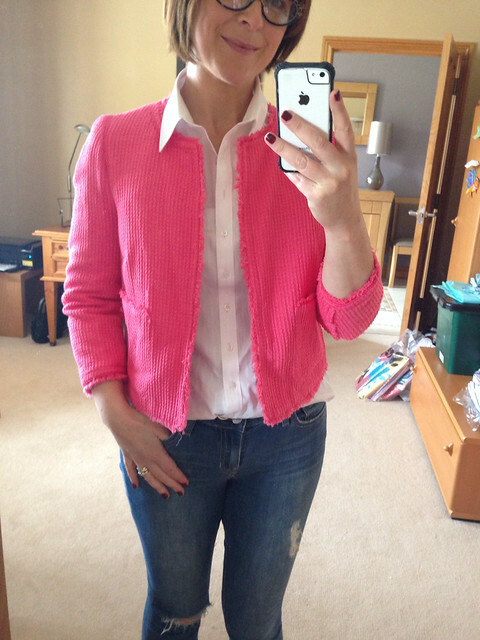 Next up, the pink frayed edge jacket that I'd admired on Joanna recently. 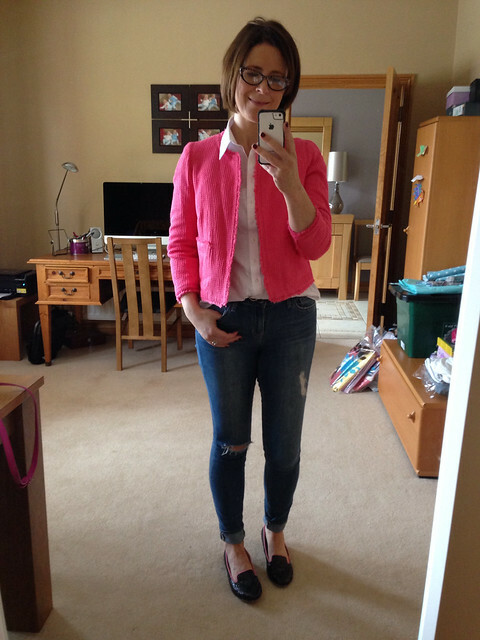 There was only a size L available and I thought it might end up being too big but in true Zara style, it fitted fine though with my long body, it came up a bit short. Without taking the tags off, I got my son to take a few photos - a great idea (much better than mirror selfies) if you're ever unsure about something. Immediately, I knew it wasn't for me. Back in the box too. The last item barely made it out of the box! 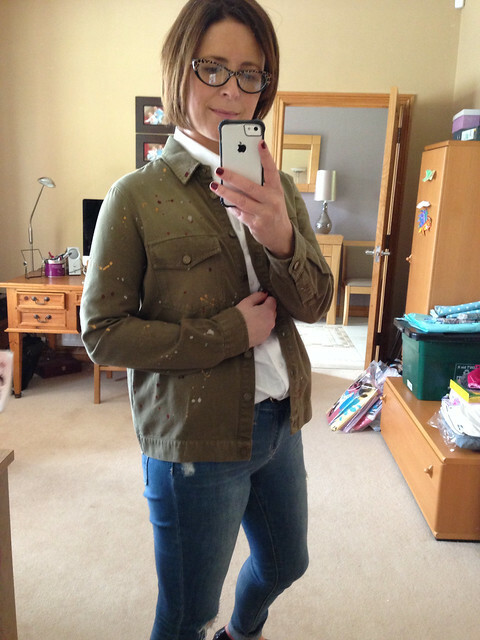 I thought the paint splattered jacket would be an interesting alternative to a smart jacket this autumn but it just looked like something a (stylish) painter/decorator would have in her van. Too much pain splattering going on. But all was not lost - I brought the lot back into Belfast yesterday and ended up with a different jacket (from the sale) & a scarf instead. More on that next, along with some other AW gems I spotted while in town. What a pity Avril, did like the yellow coat, but I do know what you mean about husbands and that 'look', every time you wear said item all you can think about is that look. Looking forward to seeing what you got in your next post. Ah the husband eyebrow, I sympathise! How do they do it? Although turns out they're often right! Awww - I was hoping for some successes there! I love the style of the orangey yellow one on you but if the colour scares you - it might not be the one. And I do hate it when the other half does the raised eyebrow thing as if to say "really???". I get that too. I want to know what you ended up with! Can I be really cheeky & ask where your glasses are from please, they're exactly what I'm looking for ! You made a good call with the yellow coat. I have the same feelings about an orange mac I have. I love it but have worn it once in 5 years!